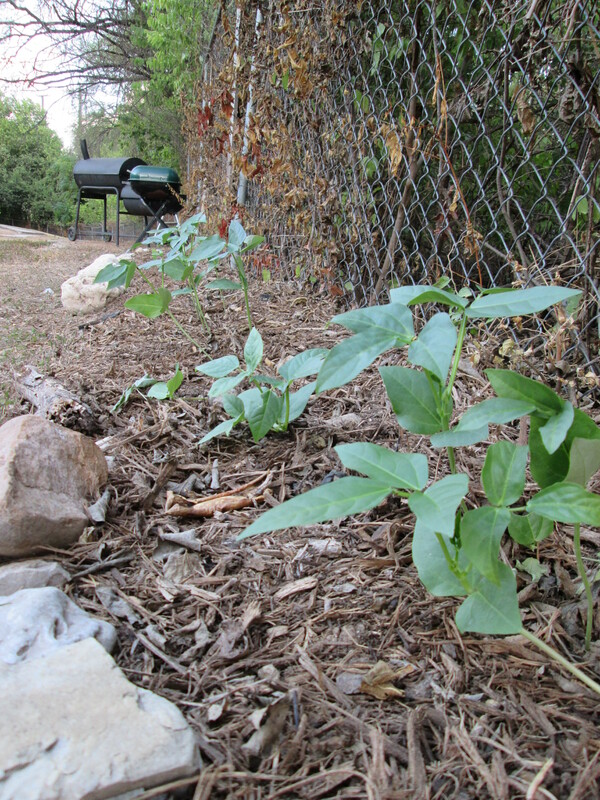 So the armadillo who was rumored to have made a buffet from the cowpeas planted in my guerrilla garden turned out to just be a rumor. I started to doubt it myself when I saw the perfectly round-shaped, little holes in the mulch, too. Whatever’s getting in there has got tiny little hands that dig, not scratch. This morning, I got my answer: a family of skunks. The dog went for them and I immediately flashed back to the skunk incident of ’08. (Where on earth did I leave that large bottle of peroxide?) The dog was lucky, but the cowpea control group, less so. Probably less than half survived. I’d even reseeded after the first raid, but then something started eating the tender little seedlings from the soil line up. Those few plants that did survive seem to be doing just fine. Now if I can just keep my dog from trampling them when she investigates the rustling leaves along the back fence, they might just produce. Summer’s just a tough time for my garden. The intense heat causes leaves to wilt midday. The containers require, at the very least, once daily watering. In the case of tomatoes and peppers, sometimes twice daily to ward off the types of soil moisture fluctuations that cause blossom end rot. 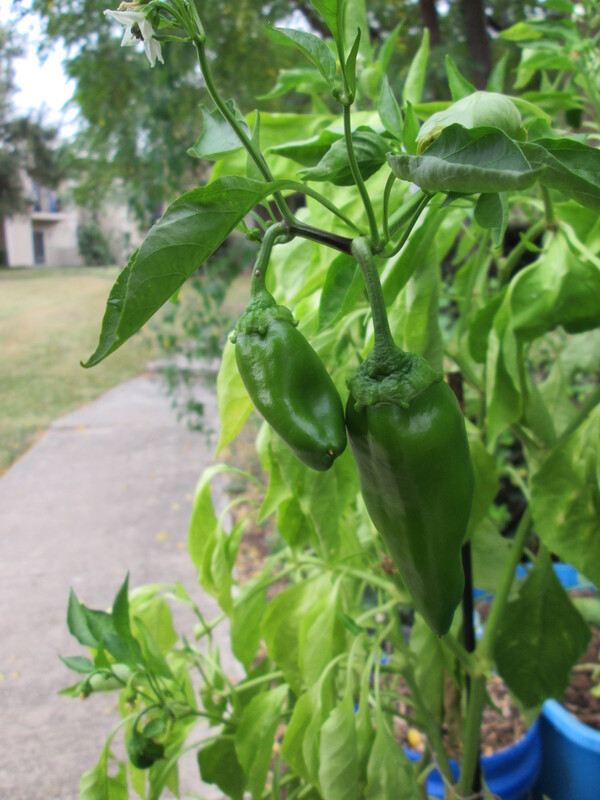 That brought up another issue I’m still investigating: when all the leaves on my peppers went from deep green to pale yellow. Too much water? Too little water? Too much crappy, chlorinated municipal water? Nitrogen deficiency? Micro nutrient deficiency? Probably a combination. None of this is helped by the infestations that have begun. Things were really going well there for a while. I had birds and little anole lizards, and ladybugs, and paper wasps protecting my garden. 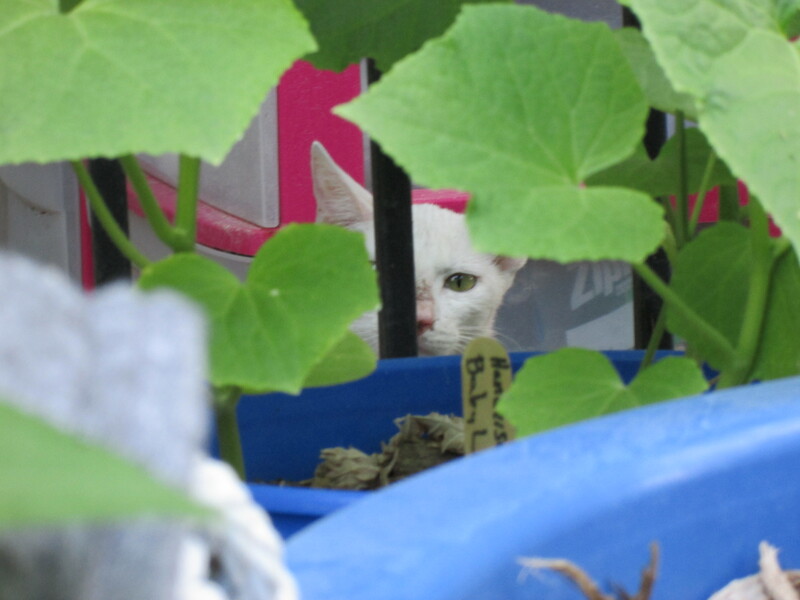 We even have a few neighborhood cats patrolling the grounds. There seems to be a rodent problem on the opposite side of the property. Not here! And then it happened… first the mosquitoes, then the aphids, then something lopped off the tops of my cabbage and broccoli seedlings. 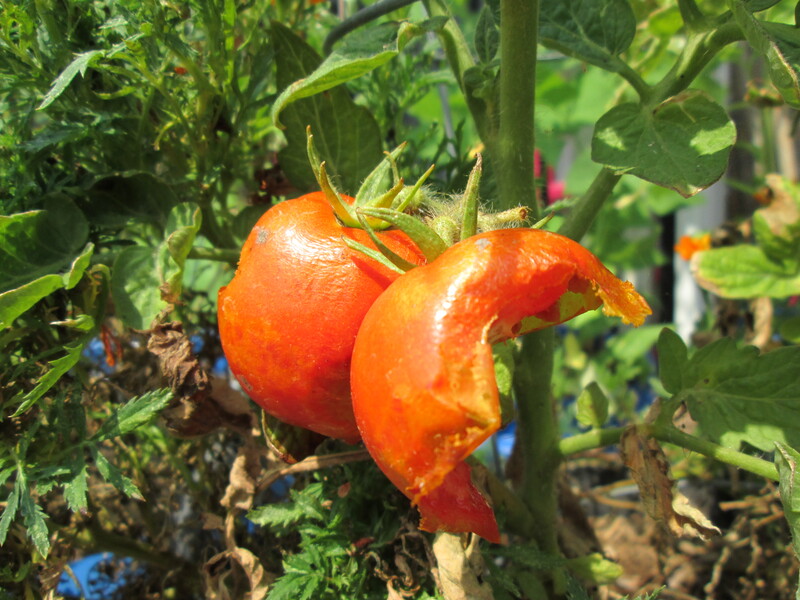 If I get my hands on the lousy vermin that ate the only two tomatoes that August produced, we are going to have a nice, short, and succinct come-to-Jesus meetin’! Summer’s tough. Maybe I got a wee bit too confident because I was getting a lot better at spring planting. It’s not all bad, though. I’ve got some okra and a nice early tomato plant that I nursed all the way up from seed this summer. I am torn, though. A nice, typically mild winter will make it fun to grow all sorts of cool weather crops, but I can’t help but wish for a freakishly hard winter freeze. I can’t imagine I’ll be too heart-broken to let all them skeeters, fleas, flies and other nasty pests die in frozen soil. I know, chances are the skeeters and I will both be wearing shorts and a light sweater come Christmas Eve, but a girl can dream, can’t she? Somebody digs broccoli… and I’m gonna get him for it! Black Swallowtail butterfly caterpillars. Cute, but hungry! We got some much needed rain today. 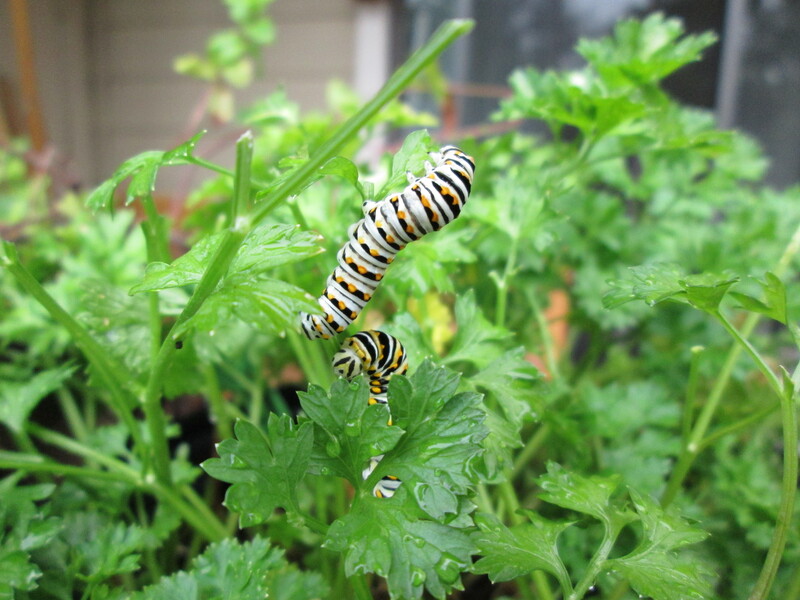 Guess I won’t be working in the garden this morning, but while I was out there, I spotted these little guys munching on my parsley.